Size : 14.8 x 19.8 inches. / 37.6 x 50.3 cm. 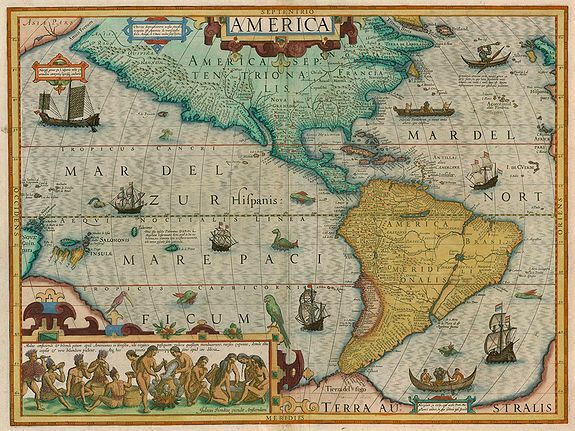 Description :Jodocus Hondius's fine delineation of the Americas is probably the most attractive map of the Western Hemisphere in the Mercator/Hondius/Janssonius succession. A clarity of composition and engraving is present here that would influence the latter maps of the Dutch 17th century. This is one of the very first American maps to use native Americans in its illustrations, a convention that was to prove popular in many early maps. John White, a member of the first English colony in North America and the governor of the second, was responsible for several original drawings of Indian life and customs. Van der Krogt 1, 9000:1B. Burden 150. Condition : Upper & under centerfold reinforced. In bright colours.